Who will rid us of this turbulent priest? To reclaim the lawful, liberal, decent society we once were, we must soon rid ourselves of the turbulent priest, along with those like him, those who support him, and those who appease his kind, urges Dr. Geoff Davies. IS THERE no-one with eyes that see how the best of Australia is being destroyed? Is there no-one with the will to name it, and the courage to call on our better angels? The rule of law, the freedom to know and debate, privacy, freedom from arbitrary detention and punishment, education for everyone, hospitals for everyone, help for the disadvantaged, family time, community time, social cohesion, the economy, infrastructure and industries to sustain our children, our priceless natural heritage, sovereignty over our own affairs, all are being attacked, undermined or neglected while we writhe in a lather of fear and distraction, jumping at shadows while hiding our faces from the real challenges staring down on us. In one of the most blessed lands on the planet, what happened to the laconic Aussie and the fair go? Until a few decades ago we were working smarter and less, becoming healthier, more creative, more independent, more tolerant, more worldly, and expecting to continue on that path. We have abundant resources and educated, talented people who speak most major languages of the world. Why are we now struggling? We could readily afford and manage the things that are supposed to be too hard. We could be calmly working together, preparing for the now-inevitable warmer climate, eliminating our contributions to global warming, producing abundant healthy food without degrading the land, welcoming immigrants no matter what their mode of arrival, avoiding needless provocation of those few who might harm us, making amends for the raw deals some have had, no matter how long it takes, seeing everyone has a fair crack at a decent life. We could do all this while enjoying our barbies, beers, beaches, brilliant sport and brilliant arts. Instead, we are more and more divided against each other, pressed onto an ever-accelerating treadmill, or discarded as useless, and fed unhealthy food, consumer addiction and a saturation diet of alarm and fear. A “law” that is infinitely malleable is no law at all. Every time a legal challenge to government abuses of innocent people looks like succeeding, the law is changed to get around it. This has been going on since John Howard made our borders comically elastic to deny asylum seekers their legal rights. A “law” administered by a politician is not a law, it’s a tyranny. Claiming decisions can be appealed is of little practical relevance to someone who can’t set foot in the country. If a court decision goes against the Government, the court is roundly abused. If an independent monitor says something the Government doesn’t like, the person is accused in the crudest terms of partisan bias. These people, these followers of the turbulent priest, have no respect for the law, and clearly have no understanding of what “the rule of law” means. They preach freedom. Then they create Big Brother to watch all of our communications. It’s not just “metadata”, which would be bad enough, but we know from documents released by Edward Snowden that they can and do access any content they want. See the movie CitizenFour to learn about our governments massively breaching the law with impunity. "Citizenfour is a gripping record of how our rulers are addicted to gaining more and more power" - The Guardian. They preach freedom of speech. Yet when a voice is raised that they don’t like they move instinctively to silence it. 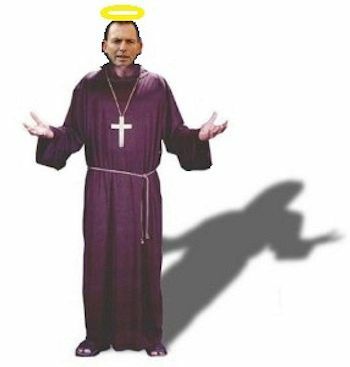 It is not just the priest, he is just the figurehead for a political-media complex. They work in concert. When the priest whistles, the attack dogs move in, enforcing their vicious right-wing political correctness. These so-called media indulge in overt political campaigning and in character assassination. They severely limit the news most people see, and grossly distort much of what they do report. They present fact-free rants and fringe conspiracy theories as having the same merit as informed commentary. They have lost any understanding of the distinction between reporting and opinion. They completely fail to recognise the large responsibilities that ought to attach to the great privilege of broadcasting, whatever the technology. We need to recognise the political power of the commercial media, and of the lobbyists for the wealthy. They are more powerful than the political parties. The Coalition is an extension of them. Labor long ago yielded its power to them, being content to operate in the small space they leave it. They need to be reined in so we can reclaim our democracy. The end of free public education is foreshadowed, and free public hospitals are being bled. The ABC is suffering death by a thousand cuts. The poor are “leaners” to be trampled. The rich are “lifters”, though they collect billions in subsidies and tax breaks. We are headed into bad economic times. The mining boom is over, its proceeds squandered on tax cuts for the rich. The automotive keystone of our manufacturing is crumbling, a victim of a simplistic ideology with no concept of industrial ecosystems. We are being tied to dinosaur industries, and the clean industries of the future are actively attacked. The economy runs precariously on housing bubble credit that could pop any time. Much of our economy is run from overseas, more of our land and property is owned overseas, and we are poised to sacrifice more economic sovereignty to so-called free trade that delivers little benefit. Our cities choke while the systems that could make them functional and liveable fall victim to short-term developer mentality and corruption. The Barrier Reef is probably doomed. There were two crucial turning points that brought us to this benighted place. The first was in 2001 when John Howard, desperately behind in the polls, started blocking the access of legal asylum seekers to our shores. Once we stepped onto the slippery slope of fear mongering, the only way to retain power was to steadily ratchet up the fear, exactly as has transpired. The second turning point was in 1983, when Bob Hawke and Paul Keating set about implementing the market fundamentalism of their rivals. “Economic rationalism”, deregulation and privatisation were never popular with the people, and have delivered only moderate economic performance at a heavy price in inequality, a weakening social fabric and loss of legal rights. Noam Chomsky: Neoliberalism and how it undercuts democracy and puts it into the hands of unaccountable, private tyrannies. The alien neoliberal world-view glorifies selfishness over cooperation. It unleashes economic anarchy, gives free rein to economic warlords, promotes vast disparities of wealth and power, and pushes us towards a new feudalism. Hawke and Keating also introduced media “reform” that delivered 70 per cent of our newspapers to Murdoch. Both moves have completely undermined everything Labor used to stand for. Since then, Labor has stepped, slipped and been wedged ever-further to the right. It is an inert mass occupying the political space where progressive reformers ought to be. We are being divided and conquered. We slip rapidly towards a plutocratic police state, and few even notice. Nevertheless there is a great unease abroad. The current PM and Leader of the Opposition are jointly held in the lowest regard ever recorded. This discontent needs to be crystallised, articulated, energised and constructively channeled. Who will step up? Bombasts like Clive Palmer and Barnaby Joyce fancy themselves. Perhaps the Greens’ new leadership will decide to step into the main arena. More independents and minor parties are around, but not many of them are progressive. We can still reclaim the lawful, liberal, decent society we once were, but we must soon rid ourselves of the turbulent priest, along with those like him, those who support him, and those who appease his kind. Dr Geoff Davies is an author, commentator and scientist. He blogs at BetterNature (betternature.wordpress.com). New study by two leading universities finds United States is an oligarchy - Chris Hayes. Q: Is Australia going the same way? Want to reclaim the lawful, liberal, decent society we once were? Subscribe to IA for just $5.